June of this year was a comedy of errors. We’d had a very old swamp cooler, and it finally gave up on functionality. A swamp cooler, for those of you who live in the Land of Central Air, or in places where air conditioning is not required – is the most common cooling device in New Mexico. The technical term is ‘evaporative cooler,’ but everyone calls them swamp coolers. Looking ours over, we realized there was no longer a repair or patch-fix option. It had gotten to the point where it was held together by little more than rust and luck. We discovered relatively swiftly that my combination of chronic illnesses made it incredibly difficult to handle 90-100+ degree temperatures with no respite. Unsurprisingly, we started trying to figure out a way to replace the swamp cooler. A timely gift enabled us to purchase an actual unit – but getting it professionally installed would have quintupled the price. That figure was a number so far out of reach as to be on the moon. We checked in with a couple friends – one bloke who’d done recovery/rescue/repair work in disaster zones pointed us at a mutual friend who KNEW swamp coolers. Friends and friends of friends descended upon our house that first day, bringing knowledge, physical ability, and some of the niftier character traits humans can possess. R2-Tea2 directed the process with skill, knowledge, and almost devastating style. It didn’t get sorted that first day, though great strides were taken. There were some… complications… with the electrical. When you live in a house as old as this one is, the chance for quirkiness is high. R2-Tea2 returned many times until the thing was actually working. Many breakfasts were shared, and the conversations were lovely. 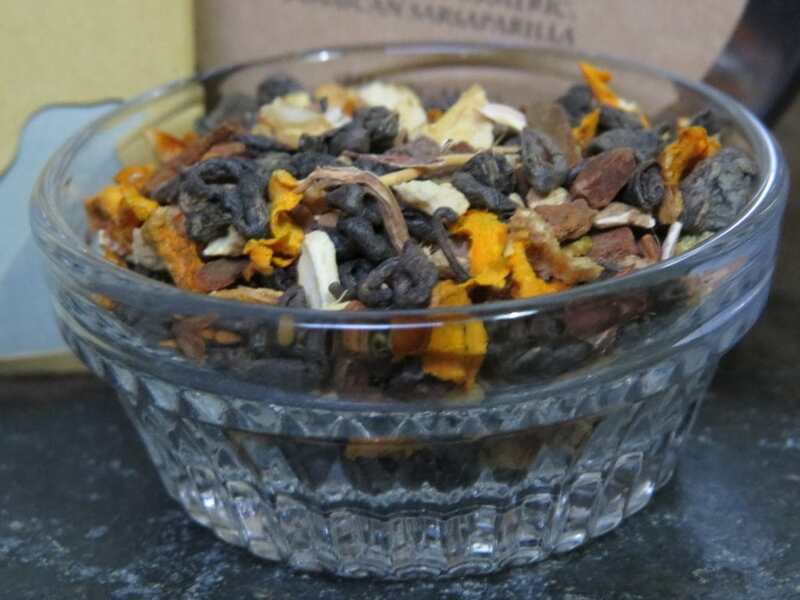 The first day of the project I’d created a new tea – as it was requested that something toddy-esque be made, that would be tasty with a tot of whiskey. However, that tea provoked a conversation about tea – which naturally led to zebradom. Sparked by this conversation, R2-Tea2 consulted her GP, thankfully one of the good ones – and discovered that we share more than troubling symptoms. 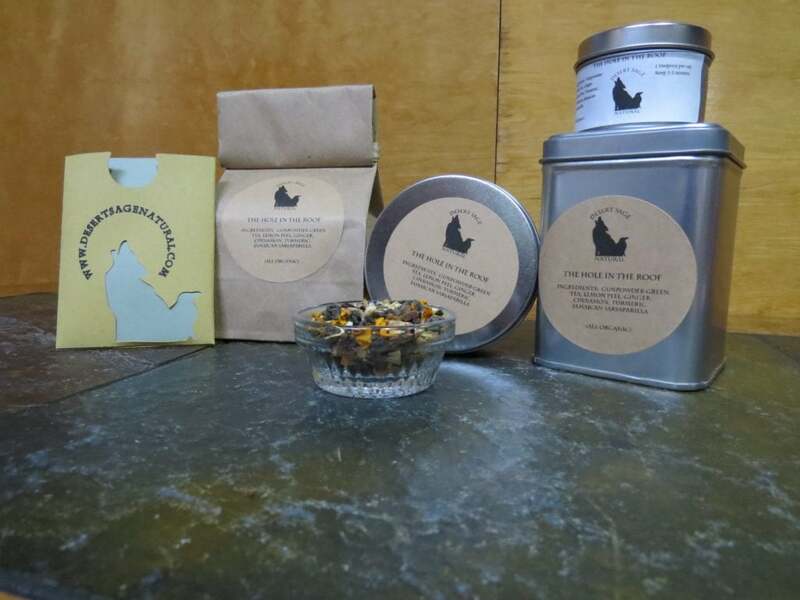 In the course of replacing the swamp cooler, we gave her a mini-tour of our teas – with special concentration on the ones that might be useful for EDS. During this tour, I had her try one of our tasty teas that is a stealth medicinal that focuses on inflammation. Sadly, it wasn’t quite to her liking, as she is one of those rare humans for which the taste of chocolate falls into the “meh” category. So I set about blending one that would have similar beneficial effects, still be tasty, and would be tailored to her taste preferences. We decided on “The Hole in the Roof” as the name, due to the circumstances of the swamp cooler, which were what provoked the tea – and as a salute to the newly deepened friendship. This entry was posted in Citrus, Green Tea, Simply Tasty Teas, Things We make (Tea, Coffee, Cocoa) and tagged Anti-Inflammatory Herbs, Citrus Tea, Desert Sage Natural, Green Tea, Organic Cinnamon, Organic Ginger, Organic Green Tea, Organic Gunpowder Green Tea, Organic Jamaican Sarsparilla, Organic Lemon Peel, Organic Turmeric, posts with audio, Simply Tasty Teas by DesertSage. Bookmark the permalink.